The international best-selling author of THE LAUNDRYMEN pulls back the curtain on the digital currency craze to prove that, when it comes to bitcoin, what you see is not necessarily what you get. Jeffrey Robinson spent more than a year trekking through “Planet-Bitcoin” to find a digital-something pretending to be a currency; that same digital-something pretending to be a commodity; a political movement that reeks of a delusional cult; and a technology – a unique peer-to-peer transfer system – that happens to be brilliant. He spoke with big players and small players, economists, tech analysts, bankers, cryptographers, digital engineers, entrepreneurs, venture capitalists, businessmen, regulators, get-rich-quick schemers, wannabes, political anarchists, and the “rock stars” of the eco system – from “Bitcoin Jesus” Roger Ver to now convicted bitcoin felon Charlie Shrem – all of whom have a stake in bitcoin’s brilliant future or abject failure. He investigates the great promises made by the “Faithful”: bitcoin will replace fiat; central bankers are trembling at the feet of this all encompassing digital currency; bitcoin is the perfect solution to the developing world’s unbanked and underbanked; bitcoin is a speeding freight train bearing down on the dollar’s dominance as the world’s primary currency; and bitcoin is wildly successful having gone so viral that it is viral cubed. And he separates the myths from the naked truths, one by one. Punch for punch, the pretend-currency can’t stand toe-to-toe with the non-convertible Cuban peso. The pretend-commodity is really just a casino chip for a loaded roulette wheel. In reality, there are fewer businesses worldwide who “accept” bitcoin than there are piano tuners in Canada. In reality, there are fewer people using bitcoins to buy goods and services than there are members enrolled in Kuwait Airways frequent flyer program. The “blockchain” technology behind bitcoin, is brilliant and will absolutely change the world. 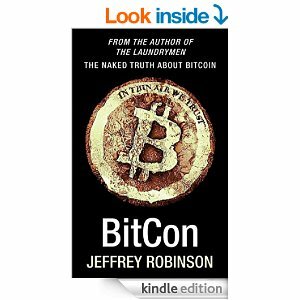 The book that the “Faithful” do not want you to read, Jeffrey Robinson rips through the headlines, the hot air and the hysteria to prove without any doubt that when it comes to bitcoin, what you see is not necessary what you get. Jeffrey Robinson is the international bestselling author of 27 books, including The Laundrymen (the definitive book on money laundering), The Merger (documenting the conglomeration of transnational organized crime), The Sink (an exploration of dirty money and the offshore world), The Takedown (the unlikely demise of the Norte Valle cocaine cartel) and There’s A Sucker Born Every Minute (a treatise on fraud). Unique in his ability to mix hard facts about extremely serious subjects with humour, anecdotes and a conversational style, he is a past winner of the coveted Benedictine “After Dinner Speaker of the Year” award. Contact us if you would like to engage Jeffrey on insights on financial crime.